We've been baking a lot of bread lately. We just can't get enough carbs over here...err..maybe I just can't get enough carbs. I mean hot delicious bread, straight from the oven, with a bit of butter on it. Who could ask for anything more? I never tire of that buttery goodness. I know my hips could do without, but my taste buds win out on the argument. 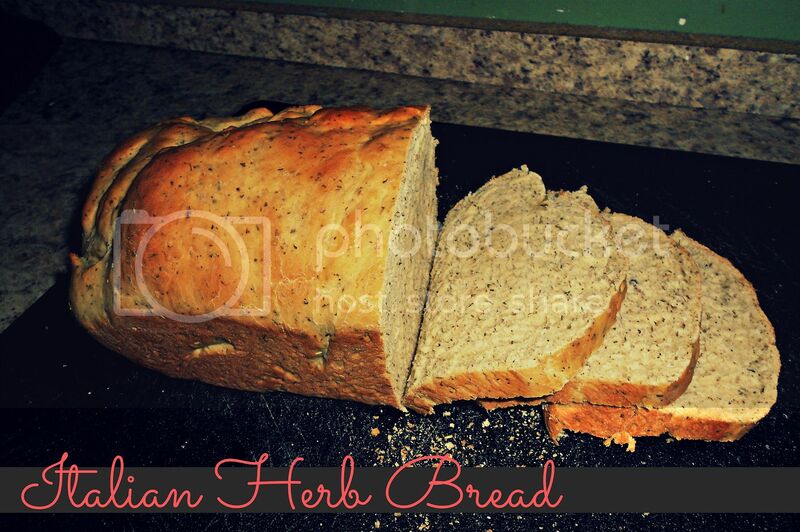 Either way we have been trying out some new bread recipes and lately my favorite has got to be Italian Herb Bread. It is simple to make in your bread machine and goes great with so many meals. We love to have it on our spaghetti nights or as a deli sandwich. I can't wait for you to try it out. Yum! Place all ingredients in your bread maker, according to your owner manual. Select white or basic bread setting and light crust. When bread I finished baking, remove from pan and cool on a wire rack. Wait at least one hour before slicing. * I made my bread by putting my bread machine on dough cycle and then baking it in the oven. I bake my bread for 30 minutes at 350'. 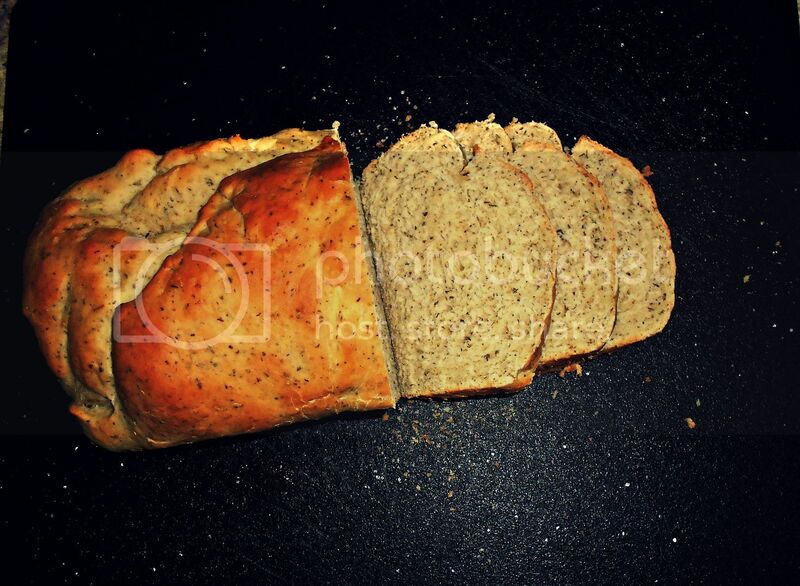 *After removing bread from the pan, rub a tablespoon of cold butter over the top and side of the hot bread. DO you have a recipe for this in the oven instead of a bread machine? Mmm...I think, I can smell it from here! How can this be converted to oven baking without the use of a bread machine? Thank you for the bread recipes, Danielle! I am trying to eat healthier AND stay within a budget, which is VERY hard! I've been following your tips and just got a bread maker for $10 as our church auction. I bought everything I needed, and it was broken. :( My husband said we can go look around for a new one, but I am going to try a few thrift stores first. My question for you is... do you have any good 100% whole wheat or whole grain bread recipes? Your breads look SO good but i'm trying to make it as healthy as possible. The recipe in the bread machine packet used molasses and some other weird things. Sorry to pest, but if you take it from the bread machine and put it in your oven, when do you do this? After the first rise? Do you let it rise again in your loaf pan? Thanks! I made this last week and it was sooo good. The second day, I cut the remainder into slices and made garlic toast to go with dinner. Everyone loved it. Thanks! I make this too....It's soooo good. I make mine with herbed butter....add some garlic powder and some Italian seasoning to butter and whip with a hand mixer. Everyone loves when I make this. I make this too...it goes really good with herbed butter. Add garlic powder and a little Italian seasoning and whip with hand mixer. Everyone loves it with the bread. I've decided to start with homemade bread and my neighbour offered to let me borrow her bread machine so that I can try if it works for me before I buy one myself (but I'm pretty sure that it is gonna work for me since it doesn't seem to cost more time to put the ingredients into the machine than going to the supermarket and buy bread). Now I'd love to try some of you recipes and since I would like to bake bread regularly and not buy it from the supermarket anymore I was wondering if you could maybe give me a list of the basic ingredients I should have at home to always be able to make bread and rolls. Since you only do the shopping once a month or do costco every 2-3 months you have all the basics at home all the time I suppose. I'm thinking about also buying the stuff at a shop like costco here in Germany, so I would be happy if you could also tell me what of those ingredients I can store and which I better shouldn't store for weeks or months (for example I read on some website that storing whole grain flour is a problem). I make bread in my bread maker and let it rise and then take it out right before it is ready to start baking and put in the oven. You can find great little books for bread at most any bread makers at thrift shops. I pinned you on pinterest AGES ago!!! I love your stuff. Quick question, and if you've already answered it sorry BUT: When you use your bread machine do you use all-purpose flour or bread flour? I just got mine at Good Will and my gram always used all purpose in hers but that was a really long time ago so I wanted to ask someone that has used one more recently. Thanks so much! I've learned tons!